Gold is climbing as bond yields rise and the dollar falls, over speculation that China is pulling back on buying US Treasuries and Japan signals it is winding down its quantitative easing program. Meanwhile, US debt continues to grow after the Republicans under President Trump pushed a trillion dollars worth of tax cuts through the Senate, that the Congressional Budget Office thinks will add $1.7 trillion to the deficit over the next decade. The Chinese buy Treasuries – effectively lending money to the US government – so that the US can keep buying Chinese goods and China can keep selling their products, earning enough dollars to convert into Chinese yuan to pay workers and suppliers. The People’s Bank of China buys US dollars from exporters, accumulating large forex reserves, and sells them yuan, to keep the dollar higher against the yuan. This gives China a competitive trade advantage. 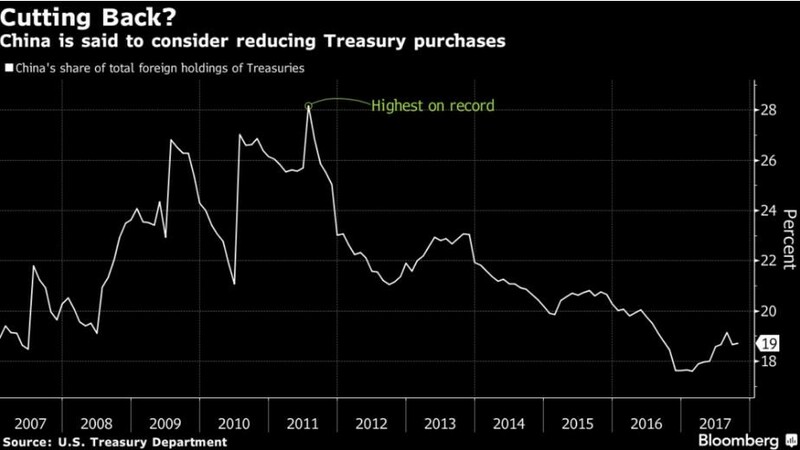 The rise in the two-year Treasury bill – the benchmark Treasury most sensitive to Federal Reserve rate hikes – pushed above 2% last week for the first time since the collapse of Lehman Brothers in 2008, the start of the financial crisis. Sound familiar? What they’re talking about is the kind of monetary system that existed before the 20th century – when banks were constrained in their loans by how much gold was in their vaults. The US went off the gold standard in 1971, thereby severing the linkage between the world’s major currencies and gold. Soon afterward, the US dollar became the leading reserve currency. While President Trump under his “Make America Great Again” banner has pressured key trading partners including China, Canada and Mexico, the reality is that passing protectionist measures and ripping up existing trade agreements like NAFTA is likely to depress the dollar – further alienating foreign investors who would otherwise flock to the greenback, and hurting the US economy to boot. Are there other basic, more fundamental reasons to buy gold? Well, read this excellent article from Bloomberg, ‘Disastrous’ deals sideline gold-mining M&A as metal rises’ posted on MINING.com. Richard lives with his family on a 160 acre ranch in northern British Columbia. He invests in the resource and biotechnology/pharmaceutical sectors and is the owner of Aheadoftheherd.com. His articles have been published on over 400 websites, including: WallStreetJournal, USAToday, NationalPost, Lewrockwell, MontrealGazette, VancouverSun, CBSnews, HuffingtonPost, Beforeitsnews, Londonthenews, Wealthwire, CalgaryHerald, Forbes, Dallasnews, SGTreport, Vantagewire, Indiatimes, Ninemsn, Ibtimes, Businessweek, HongKongHerald, Moneytalks, SeekingAlpha, BusinessInsider, Investing.com and the Association of Mining Analysts.